Tuesday means Forgotten Film day around here, so don't forget to check in at Todd Mason's blog, Sweet Freedom. As genial host of our weekly meme, Todd's blog is a veritable hot bed of links to other Forgotten (or Overlooked) Films(or other audio visual material, i.e. Television) posted by other movie mavens. But I can believe anything of Orson Welles. He has the look of a possible debaucher. At any rate, I think he was an excellent choice. He looks good too. This is years before Welles gained all that weight and allowed megalomania to check his brilliance. As the dashing Mr. Rochester he has the swagger of a full blown ego - a spoiled, self-centered boy grown into a reckless man filled with regret who nevertheless, does as he pleases - and filthy rich to boot. JANE EYRE begins with the unhappy young Jane (played very effectively by Peggy Ann Garner) being shipped off to the grim Lowood School by her imperious, hard-hearted aunt (Agnes Moorhead) who has an unreasonable aversion to the young orphan. The head of the school, Henry Brocklehurst, is played in odious fashion by the one and only sour puss of all sour pusses, Henry Daniell - hiss-s-s-s-s! He personifies everything foul and icky and you immediately know that little Jane is in for a hard time. Sure enough, at the cheerless Lowood, the plucky Jane is treated like a pariah and cruelly punished for the slightest infraction. Only one girl has the heart and daring to befriend her, the sweet-natured Helen Burns (Elizabeth Taylor). The two become inseparable until some sort of wasting disease (possibly pneumonia) takes the beautiful Helen away to a better place. The doctor (John Sutton) who treats Helen does remonstrate with Brocklehurst about the girls' treatment. But truth to tell, there's not much he can do. He does manage to give a grief-stricken Jane a few words of coping advice. Better than nothing, I suppose. 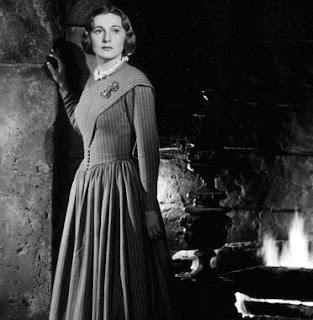 Eventually, Jane (now played by Joan Fontaine) who has stayed on at Lowood to teach, finds an escape. She advertises for a job as governess and before you can say 'mad woman in the attic' Jane arrives at Thornfield Hall, a dignified pile of rocks somewhere unspecified, maybe Northumberland. 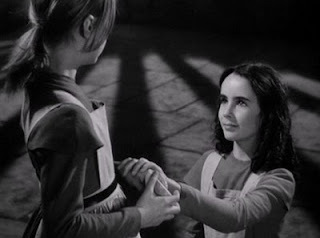 Jane Eyre brings a needed breath of fresh air to Thornfield in her job as governess to a little French girl (Margaret O'Brien), Rochester's ward. Supposedly the child is the offspring of a French 'dancing girl' and 'who knows who?'. Rochester claims in an offhand way that she is not his, merely a child left orphaned when her mother, a 'French dancing girl' and Rochester's mistress, died. Even Rochester's jaded eyes were opened when he found said dancing girl preferred a preening soldier in a pretty uniform, to him. I mean, really. Back to the present: a lonely road covered in fog on an evening when Jane is either going for an aimless walk or off to mail a letter - whatever - the ambiance is perfect for a romantic first meeting. After spending months living at Thornfield with just the company of a child and a chatty housekeeper (And by the way, it's never made clear in the films whether the housekeeper knew about the mad person lodged in the attic. I mean, I'm assuming she knew, but sometimes it's hard to tell.) Jane is unprepared for company. Especially that of a lone rider thundering down a dark road accompanied by a huge dog name Pilot. The dog is different in every film as well. 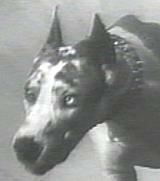 In this one, it's a Harlequin Great Dane. Just so you know. 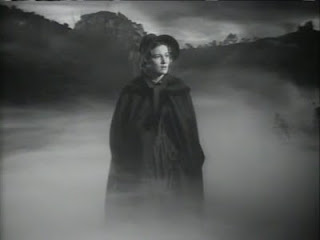 After stumbling, Jane rises up out of the fog, confused by the sound of oncoming hoofs. Rochester's horse takes fright and rears up, throwing its rider to the ground. 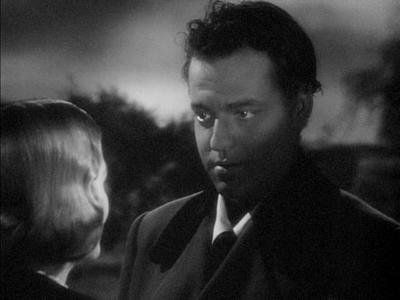 Orson Welles is instantly intrigued by the black clad young woman he mistakes for a sprite in the dark of night. He admires her care and concern, her plucky insistence on helping him back into the saddle. Later, he comes to admire her naturalness (something not usual in women of that era), her refusal to be brow-beat or insulted. She makes him ashamed of his arrogance, I suppose. He is taken aback by the fact that she considers herself his equal - not in society but in humanity. Again, before you can say, 'mad woman in the attic', Jane and Rochester fall in love. Though Rochester takes some sort of fiendish delight in leading Jane on - making her think he prefers the Honorable Blanche Ingram (Hillary Brooke), an icy beauty who is contemptuous of underlings, most especially, governesses. Rochester invites Blanche, her indulgent mom and assorted other high-toned locals to a house party. Unfortunately, in the middle of the revels, an unexpected visitor arrives, all the way from Spanish Town, Jamaica. Joan Fontaine is excellent as the unyielding, un-bending Jane - a woman who, despite her years and inexperience, knows more about life than Rochester supposes. Her natural and very moral superiority is at the heart of her refusal to overlook - all together now: the mad woman in the attic - once she realizes that Rochester is not free to marry her. She leaves him, heart-broken and bereft, and only returns after a series of improbable events, led to him by a call heard in the wind on the moors. Did I say Bronte understood romance or did I not? 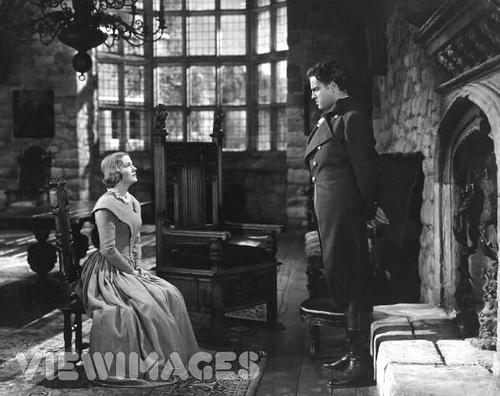 When Jane arrives back at Thornfield, it is a wreck of its former self, as is Rochester. 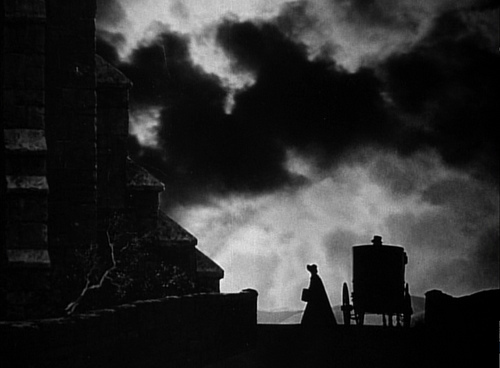 A classic book given a brooding, romantic film treatment, shot beautifully in black and white. I've stopped just short of calling this version of JANE EYRE, true film noir, though camera-wise, that's exactly the treatment it's been given here. 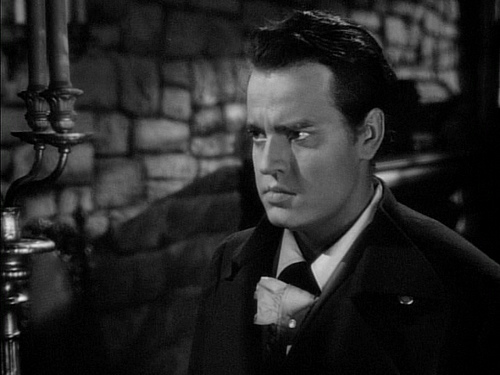 I especially love the way Orson Welles' eyes are lit to give him an eerie other-worldly intensity. Very effective. I love the lightning hitting and severing the branch of a tree at the moment of Rochester's marriage proposal. Again, very effective. 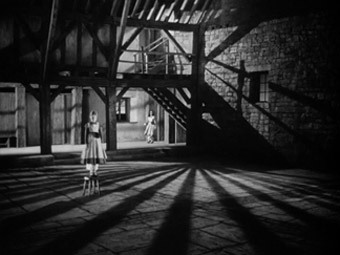 I also love all the slinky shadows and musical foreboding and the way Orson Welles gives this version of Rochester an aura of coiled tension. Most especially, I love the ending. Okay, I admit it, I love this film. This looks amazing! I'm gonna look for it! I've read Jane Eyre over a dozen times since 4th grade, and it's one of my favorites. But one thing - Rochester doesn't kill Adele's mother. She is supposed to have died at some point when Adele is small, so he takes her in. Adele's mother was with many men, but Rochester didn't kill her. Anyway, that said, I've never been pleased with any of the JE films, but this one is likely the closest. Most of the others go out of their way to make Jane unattractive. She is noted to be plain but not ugly. 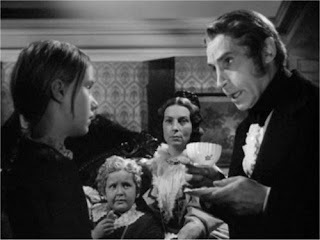 Also, most of the films don't develop any of the intensity between Rochester and Jane, particularly the newest film version. HORRIBLE. It's a story of undying love, and you don't really ever understand why these two people love one another so much. So annoying. Whew. Ok, I'm done. It's just that, as you said, every few years they talk about re-envisioning Jane Eyre, and I get so excited, and then...nothing. I do need to go back and watch this again, though. Thanks! Gosh, this is quite a review, as always. 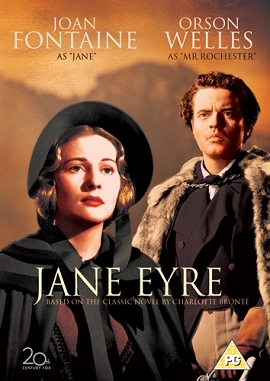 I have never gotten as much out of Jane Eyre, the book or any movie version, as in this book. 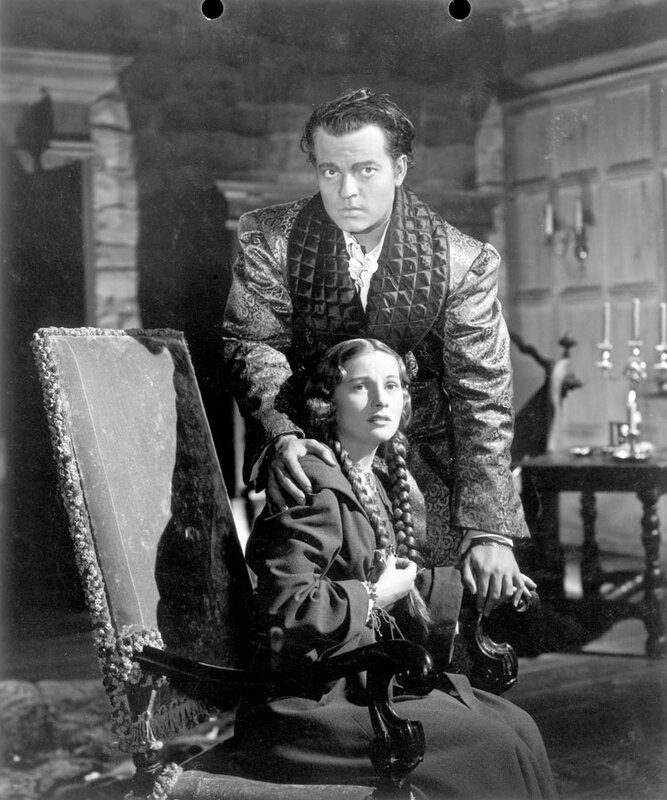 Orson Welles as dashing young Mr. Rochester, besotted by plain Jane, who has integrity and balance is new to me. I was never thrilled with the book, somewhat due to its overall dreariness and sadness. I don't think I'll see this movie, but I sure as heck enjoyed this review. Excellent review, Yvette! A frantic reminder that it's time I read all three Bronte sisters, whose classics are on my shelf, and watch the film adaptations too. Love this version even if Fontaine seems too old for the part. Welles makes a good Rochester, doesn't he? And somehow the black and white work well in this version. Thanks, Todd. I did enjoy myself writing this one. I'll try and include more of what audio/visual means - don't want to turn it into a laundry list, after all. :) But I'll do my best. Hi Marcela, welcome to the club. :) I hope you do find a copy of this JANE EYRE to watch. It's a keeper. I thought in the film he says he killed them both. Maybe I'm mixing it up with another film. Thanks for the correction, Picky. I'll change it immediately. 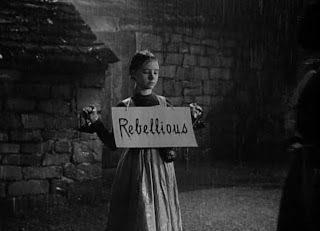 Yes, of all the JANE EYRES, this is the most intense and I credit Orson Welles' persona as well as the photography and music. At any rate, I am so in agreement with you about the latest JANE EYRE. Michael Fassbinder is AWFUL in the part. He doesn't even look attractive to me. Ugh. Thanks, Kathy. I do wish you'd see this version of the book though. 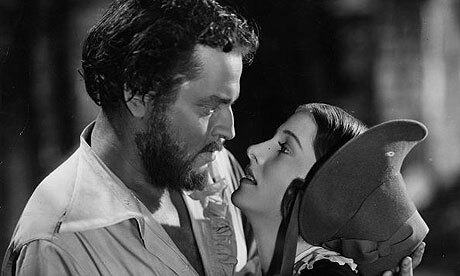 The ending is wonderful, made so by Welles unbelievable joy at having his Jane back again. So touching.....sigh! Thanks, Prashant. But don't watch the latest one. It's a stinkeroo! This is a great adaptation Yvette, i agree - but then I'm a card-carrying Wellesian and was very much a Welles production even though he didn't take an on-screen producing credit. Stevenson of course had a pretty distinguished career and is best remembered for directing lots of Disney movies including MARY POPPINS, THE LOVE BUG and BEDKNOBS AND BROOMSTICKS. 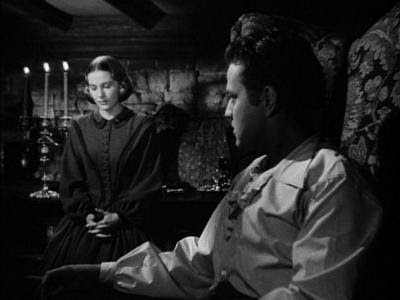 The movie also has a wonderful score by Welles' friend Bernard Herrmann - intriguingly, Herrrmann reused some of his thematic material (along with some from GHOST AND MRS MUIR) for his grand (and little performed) WUTHERING HEIGHTS opera - what's a Bronte or two between friends, right? It's so interesting to see the very young Elizabeth Taylor — at least in the image you've posted, she looks like a small version of her very mature self, rather than a child. The illustration in your post, from the 1943 Random House edition, is from the book I read when I was a teenager. 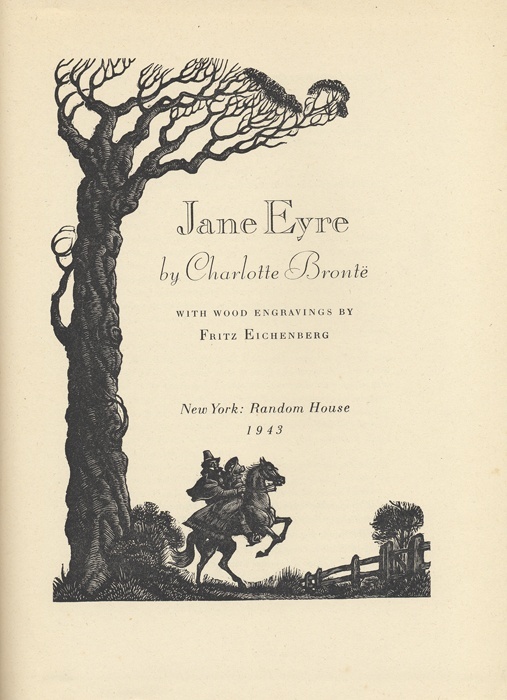 There was a set of Jane Eyre and Wuthering Heights, both of which I read. It makes me nostalgic for my childhood library, where I found all sorts of wonderful books to read. I'm sorry I passed up a chance to buy the set at a library sale several years ago. Oh you are so right, Sergio. The music is part of the story here. Talk about ominous. Far as I can remember, Jane doesn't even get her own theme. It's all thunderous and filled with foreboding. 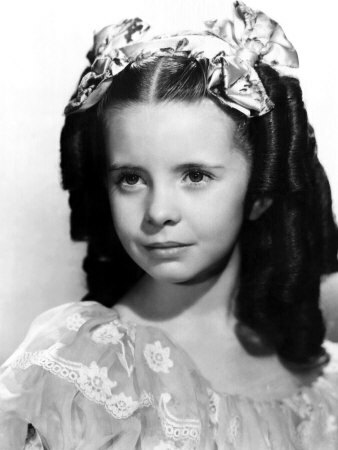 Mark: She does look very much more sophisticated than Peggy Ann Garner. But she's supposed to. Taylor suits the part perfectly. And yes, she was an unusually beautiful child with a certain 'air'. Joan, coincidentally, I'm talking about that book and the work of artist Fritz Eichenberg, today in my newest post. I meant to do it all along - that's why I used the title page. Gorgeous work. Actually, I'm not a Wuthering Heights or Jane Eyre-type reader. I like contemporary good mysteries or other fiction. 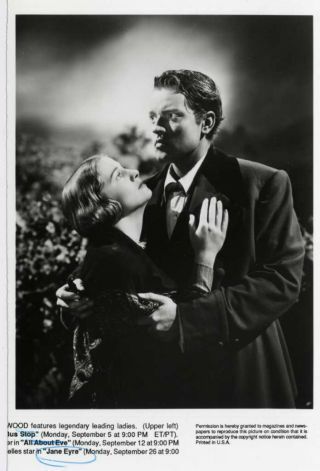 Favorite movies of mine include Notorious, The Lady Vanishes and other more current ones. I just rewatched Dark Passage with the winning Bogart/Bacall combination. If more movies were made like that today, I'm be happy.